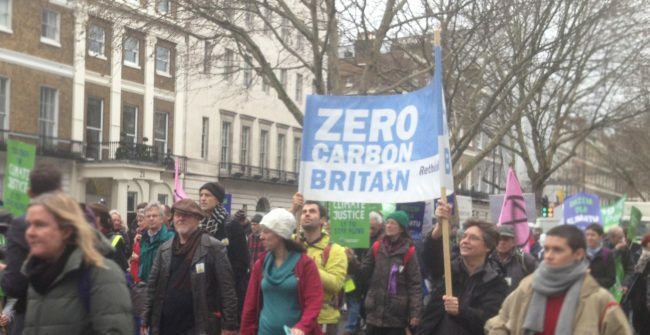 Home » London Climate March: It’s about time – for solutions! 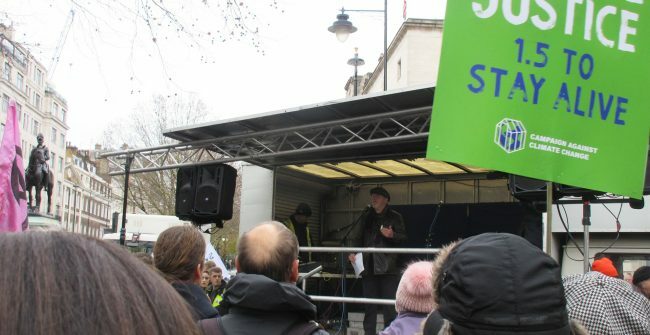 Paul Allen shared CAT’s Zero Carbon Britain solutions with the many hundreds of deeply committed climate active citizens who braved the rain on Saturday the 1st of December to march together on Downing Street. As crucial UN climate talks (COP24) kick off in Katowice, Poland, I was honoured to share CAT’s Zero Carbon Britain solutions with the many hundreds of deeply committed climate active citizens who braved the rain to march together on Downing Street. To link to COP24, the march began at the Polish embassy with speeches from a wide range of experts including Clive Lewis MP, Labour Party, Sian Berry, co-leader, Green Party, Richard Roberts, fracking direct action campaigner, Asad Rehman, War on Want, Anna Gretton, Extinction Rebellion, Neil Keveren, No 3rd Runway Coalition, Beatriz Ratton, Brazilian Women Against Fascism and Nita Sanghera, Vice President, UCU. The key message of my presentation focused on how we bridge that yawning chasm between those who have grasped the highly serious predicament of our climate emergency, and the millions still unaware of what’s going on. I explore how the climate movement need to adopt a new best practice of ensuring AT LEAST 50% of our messages, social media content, speakers or referenced science, focuses on solutions and the multi-solving ‘better world’ they can bring to us. This is vital if we are to reach beyond the already committed. As we can see from the rapid growth of movements such as Extinction Rebellion, more and more people are realising we are in a really tight spot with regard to climate. But sharing a problem as serious as a planetary climate emergency, without also giving equal emphasis the solutions, can so easily drive busy, hard-working people to reside in that reassuringly familiar BBC voice of Dad’s Army’s Private Frazier saying, “We’re doomed, Mr Mainwaring doomed”. Despite the fact that we know the challenge we face is both real and highly serious, if we ONLY share problem-focused narratives of impending chaos and collapse, we make it hard to imagine positive outcomes, which can trigger division, depression or denial. If we in the movement are unable to imagine a positive climate justice future, we will struggle to empower our neighbours to join us in co-creating it! As I travel across the UK sharing CAT’s Zero Carbon Britain research, I am regularly inspired by an amazing array of innovative & authentic community scale projects – warm homes, community energy, shared land, women cycling, repair café’s, meaningful jobs, local healthy food – together showing real life roots of a Zero Carbon future alive here in the present. Let’s Scale them up!!! The reason we face a climate emergency is primarily due to a lack of leadership. We need to step into that role at local, city and regional levels. As we see in our responses to major floods or terrorist attacks, acting on a major emergency un-leashes a powerful sense of common purpose to help and support people. Actually rising to this challenge is becoming one of the deepest and most powerful heart-felt motivators of our time, building bridges, and uniting us across economic, cultural and political lines. There are resources within ourselves, and within our communities alive and waiting to spring into action. The march ended at Downing street, and all those who walked together are now back at home working within their local communities, councils and NGO’s. As we all press ahead with the hard, up-hill, task of raising ambition and pressing for genuine political leadership at national and regional levels; my suggestion is that, if we all can adopt a ‘best practice principal’ of at least half of our communications focusing on an evidence-based vision of what it would be like to live in Telford, Bristol or Cambridge in a Zero Carbon future, it offers a much more powerful tool for engaging busy citizens, councillors and neighbours. Moments of crisis, like the one we face today, as more and more of us deeply accept the very serious nature of the climate challenge, can un-leash a sense of collective purpose which pulls us together in common cause and brings to life a stronger, collaborative and more cooperative global society. The science says we must, the technology says we can – it’s time to get on and just do it! !